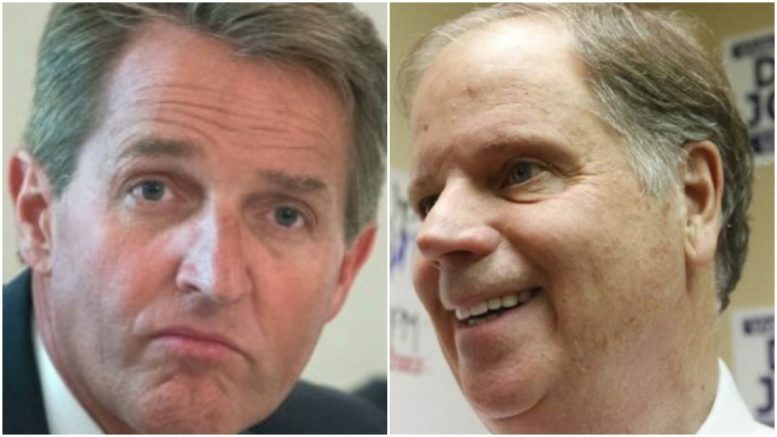 Proving that he has no principles or backbone, establishment RINO Jeff Flake donated money on Tuesday to anti-life open borders Democrat Doug Jones, bragging that he’s somehow putting “country before party” by supporting an Alabama Senate candidate that would certainly move the country further towards its destruction. Jeff Flake, who pretends to be a conservative Republican yet has a liberal voting record, and is so unpopular in Arizona that he bailed out of a primary challenge rather than losing in 2018, bragged about sending money to progressive leftist Doug Jones by posting a copy of the $100 check he wrote on social media. And defending a man (Moore) who has lied in a Church and refuses to debate and is being defended by Trump himself. Why not just support Trump and Putin if you are to support Moore. He doesn’t believe in debating which how can you defend this. There were people when David Duke ran that they should vote for the crook and the person running against Duke wasn’t a good candidate either but Moore with his women problems is not gong to be someone that can change anything on this issue and anyway it has been a wedge issue. And a video of Moore is circulating in which he say that maybe Putin is right that America is the focus of Modern Evil in the world. Sad this is the kind of religion they stand for. State run by the Russian Orthodox church.